(Toronto, ON) – More than ever, busy Canadians are looking for straightforward and intuitive access to shop for a new car, to understand what vehicles are built in Canada, to learn more about world-leading hybrid technology, or to look-up their own Toyota vehicle information. So, Toyota turned to current Toyota owners and potential customers from across the country requesting feedback from more than 1,800 visitors to Toyota Canada’s web site and conducting focus group discussions. The results have been incorporated into a significant update of www.toyota.ca. A new catalogue of vehicles that appears on the home page, making it easy to click through to any Toyota model. A “Shopping Tools” tab that provides instant access, in one menu, to all the online resources a new buyer needs to shop for a Toyota, including applying for financing, booking a test drive, and appraising a trade-in. 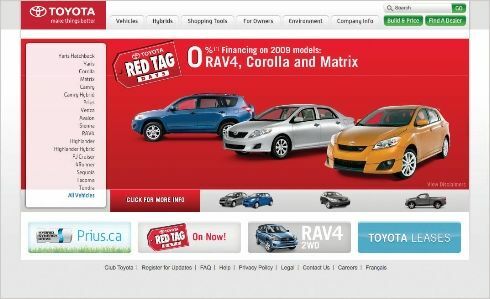 Two of Toyota’s most popular web features – the “Build & Price” and “Find A Dealer” functions – now have their own buttons that appear on every web page. What’s more, the “Build & Price” tool buttons has been improved to make it easier to use. Visitors can choose a vehicle, add options and accessories, and receive a manufacturer’s suggested price, including taxes and fees. Shoppers can then calculate downpayments, monthly instalments and even benefit from some capabilities unique to toyota.ca, such as: calculating applicable provincial tire and battery taxes and factoring in the value of a trade-in, based on current Canadian Black Book figures. In order to make things better for current Toyota , Toyota has also made the tools that manage their vehicle information and dealer interaction more accessible. A “For Owners” tab allows current Toyota customers to request a service appointment via Club Toyota, get information about parts and warranties, and update contact information for Toyota.